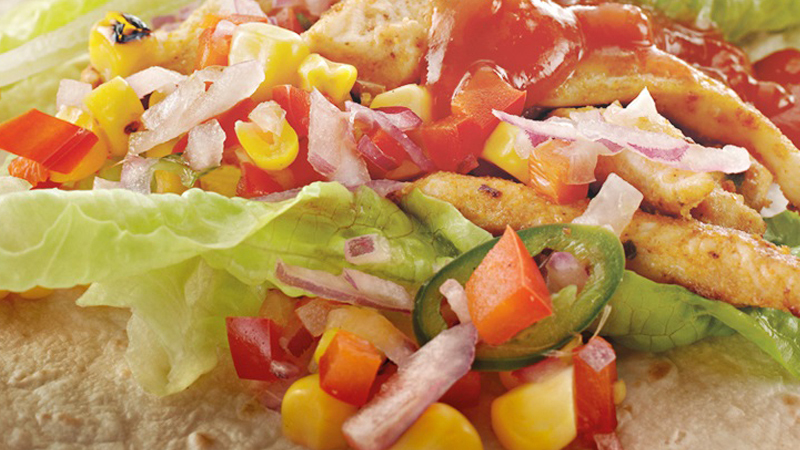 This Old El Paso™ recipe makes 8 fresh seared chicken and corn burritos in just 20 minutes with our Healthy Fiesta Kit. It’s authentic Mexican cuisine right in your kitchen with ingredients like corn cobs, red capsicum and sweet baby lettuce. Toss chicken and Healthy Fiesta Seasoning in a plastic bag to coat. Spray non-stick frying pan with oil. Heat chicken for 5 minutes or cook until golden brown. Place corn cobs in boiling water for 2 minutes. Drain and with a sharp knife remove kernels from cob. Place corn and capsicum in a pan and toss over a high heat until slightly charred. Combine corn mixture, onion, lime juice and honey, and place into a serving bowl. Place warmed Tortillas onto a platter with lettuce, corn mixture, chicken and Mild Mexican Salsa. Let everyone fill and wrap just the way they like it.